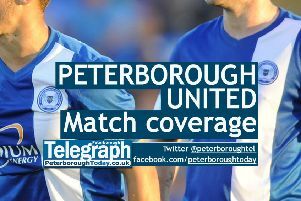 Peterborough United manager Grant McCann is a believer and so are his players. They are now preparing to make the fans believe that promotion from League One is a possibility in 2017-18. Posh director of football Barry Fry has enjoyed a successful summer. In McCann’s tough first year as Posh boss he managed to arrest a five-year decline in League position. McCann is now determined to ensure more forward momentum follows as Posh attempt to end a five-year stay in League One. Posh finished in 11th place last season, but that’s not good enough for a chairman like Darragh MacAnthony who continues to pump money into a club he purchased over a decade ago. “There will be 17 or 18 teams who believe they have a shot at promotion this season,” McCann stated. “And we are one of them. There is no other way to approach a new season. “What would be the point of starting with a view you have no chance of accomplishing anything? That you have no chance of finishing in the top six? “It won’t be easy of course, but it’s a challenge me, my staff and the players are looking forward to enormously. “I wouldn’t rule any team out of a promotion challenge this season. “Northampton have made about 14 signings this summer and they will be confident. Bury have probably made even more signings. “You never know what lies ahead. Who could have predicted that Fleetwood would end up in the play-offs last season? “They have shown what’s possible with good organisation, good signings and self-belief. They will be the template for a lot of clubs this season. “We have a good chance. Believe me the atmosphere in our dressing room is 100 per cent better than it was last season. “We have a real positive vibe. “We have a dressing room full of strong characters and positive characters. “We have made some great signings thanks to the backing of the chairman and the skills of our director of football Barry Fry. “We had a lot of ability in the squad last season, but we didn’t have the right characters. That’s all changed. “I don’t see a Sheffield United in the division this season, but I do see an improvement in the general standard. “Some big clubs have come down and will expect to challenge to go straight back up and I don’t see the top three teams in League Two last season having to struggle against relegation. “But I have great confidence in my squad. I’m very comfortable with the players I have. The bookies are not sharing McCann’s optimism. The latest odds on Posh to win League One with Sky Bet are 22/1. The odds for McCann’s men to win promotion are 15/2. They are the longest odds on Posh to return to the Championship in the four seasons since they left. “I can’t worry about what the bookmakers or the pundits think,” McCann added.